The archive and sync functions for your NOOK Tablet enable you to keep any content you have purchased even if you do not want to store it on the device itself. Once you buy a book from Barnes & Noble, you own the license to that title on any device or application (up to the limit of six) registered to your account. 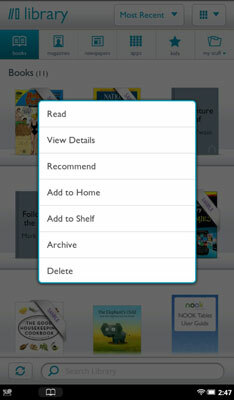 You can leave the book file on your NOOK Tablet, or you can archive it back to your account, which removes it from the tablet but keeps it in your available material at BN.com. You can also update, or sync, your NOOK Tablet to your BN.com account; doing so keeps it up to date with all of your currently purchased content — except for those you archived. Performing a sync lets you know about tablet updates, book loan offers, and other notices. It’s in the lower-left corner and has an icon of two curved arrows forming a circle. Press and hold on the book cover. A menu offers several options. The book disappears from the Library, but it’s on a shelf called Archived. Tap the My Shelves button. Scroll through and find the Archived shelf. Press and hold on the cover. The book is removed from the Archived shelf and goes back to the Library.